Twenty-years ago, you could walk into a video store and pick out a certain kind of low-budget science fiction movie. Movies that looked the same, but if one had lasers, starships and a cyborg suit in it, it was probably worth watching. Big budget visual effects have all but killed that level of film, but director Shane Abbess hopes to remind you of it with The Osiris Child. Wait, I’m sorry, the official title is Science Fiction Volume 1: The Osiris Child. That’s because this story is not just the start, potentially, of a bigger world, but a 100% throwback to low-budget science fiction serials of the past. The difference with Abbess’ work though is that The Osiris Child never looks low budget. The visuals are great, and it uses old tropes to create a familiar, full and fun new world. It goes like this: Kane (Daniel MacPherson) is a Lieutenant in Ex-O, a company that terraforms planets for the people of Earth. One day, he finds out that the company has a side project to create creatures who’ll wipe out populations on some of these planets. Those creatures are let loose and he must team up with an escaped convict named Sy (Twilight’s Kellen Lutz) to travel across the world to save his daughter. Abbess structures the film in a very Tarantino-esque style, jumping back and forth in time with chapters titles that slowly reveal the pasts of several of the characters. A few of these chapters, like a prison break subplot, feel superfluous at the start but, by the end, the decision makes sense. Meanwhile, the A-story moves forward as Sy and Kane meet weird new characters in this vast desert wasteland of a planet leading to the location of his daughter: the capital city of Osiris. Which is a long way of saying, there’s nothing particularly new here. There’s the Tarantino structure, Mad Max-looking planet and Star Wars or District 9 feel to the ships and technology. The monsters, called Raggeds, are a Rancor and Ninja Turtle mashup. The ships are Battlestar Galactica Vipers meet Tie Fighters. There’s a cantina scene. And yet, it’s all handled with such a serious tone that it becomes kind of endearing. You care about this story. It’s got some scope and rarely pokes fun at itself. There’s a badass scifi dogfight in the clouds. Kane’s apartment is filled with lots of cool technology like an AI that can research his ex-wife’s new boyfriend. The ending leaves room for more, but it’s also completely satisfying. These are the kind of details science fiction lives on. Rachel Griffiths plays the evil general in Ex-O. And yet despite all its positives, you just can’t help feel like something is missing that would bring it all together. It’s not the visuals, which impress for what is obviously a smaller production. Nor is it the story, which is familiar but steeped in enough mythology to keep it interesting. The actors too play their roles with a straight face and total belief in the material. No, my guess is a relatively simple thing: the music. Minutes after watching the film, I couldn’t remember a single cue of music that excited me. And in a movie that has grand aspirations to be Star Wars, The Matrix or Starship Troopers, that’s a key. Brian Cachia’s score hold sthe movie back from cult classic status and, instead, relegates it to a fun Friday night on Netflix. Whether or not you’ll ever get that chance is a whole other story. 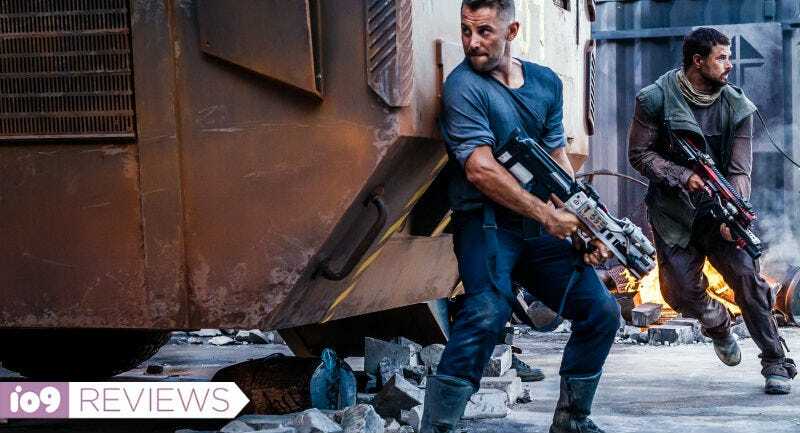 The Australian-made Osiris Child premiered at Fantastic Fest 2016 and has yet to acquire any formal distribution. Maybe it will. I hope so. It’s a movie fans of nostalgic science fiction should really enjoy. It tries to be more and stumbles, but that’s okay. Movies like this are why we love the genre in the first place.